"Nutritious, delicious, easy, and so elegant. Garnish with a strawberry, a blueberry and a drizzle of honey." Place about 1/2 cup strawberry slices into 2 glasses or parfait dishes. 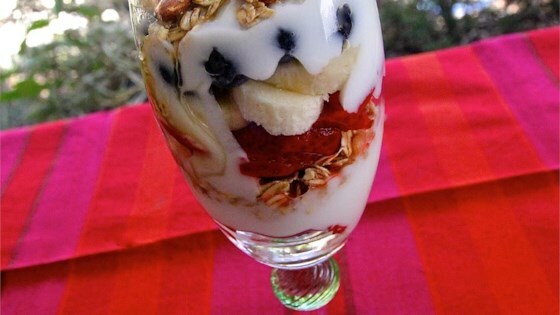 Spoon about 1/2 cup yogurt into each glass and top with about 1/4 cup granola. Divide remaining strawberries into glasses and top with banana slices. Place about 1/4 cup blueberries over bananas and top with remaining 1 cup yogurt. Layer remaining 1/2 cup granola over yogurt and drizzle each parfait with honey. I used Cascadian Farm cinnamon raisin granola and vanilla greek yogurt. My kids ate every bite.......then asked for seconds. Absolutely delicious! Enjoyed for breakfast today. Nice selection of fruits, yogurt and granola. Quick, easy to assemble, just quick to devour it. Boys made it for their dad on father''s day to eat while breakfast was cooking. Definitely a keeper. this is a awesome breakfast. I used the limited edition of cheerios very berry cereal in place of the granola and I dusted it with brown sugar. Really good.